John Snowberger, son of famed Indy 500's great "Russ Snowberger" has his father's qualities with his meticulous eye for art and flowing lines, he has become one of the finest crafters of hand-modeled race cars in the world today. When John began, he crafted his cars from wood. Later on, he began constructing 1/8" scale racing machines of the very aluminum and other materials which comprised the full size machines of yesteryear. His models are not the stamped-out $150 cars one sees advertised in magazines. Every car John turns out is hand-formed as a one-off creation, with 30 to 40 hours of work involved. The body panels are fitted to the exact specifications as the original Indy roadsters of dirt track champ cars. Unlike most such cars, the nose, side panels, tail and all related body parts are separate pieces. Even the knock-off wheels and hubs are functional. 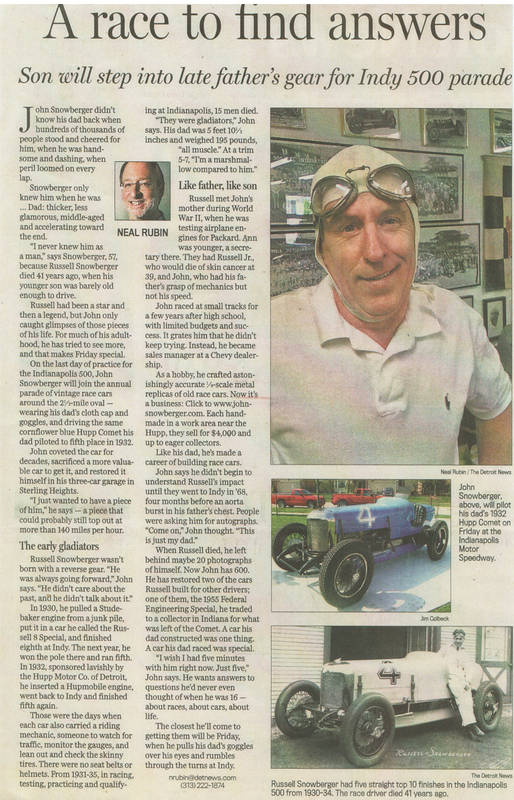 John has built everything from a replica of his father's 1928 Marmon front-drive Indy car to the famous Grant King-chassied STP Oil Treatment Special, a championship dirt track racer driven by Mario Andretti. 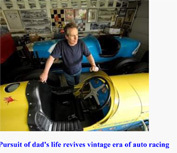 In between are models of his dad's famous Studebaker-powered Indy car, the famous Belanger 99, and a stunning array of Kurtis-Kraft and Watson Indy roadsters. Some of them include Bob Sweikert's '55 Indy winner, Lindsey Hopkins Indy roadster driven by Bill Vukovich, and the '63 Agajanian Willard Battery Special known as "Ol'Calhoun," driven to victory by Parnelli Jones. The model of the Studebaker driven to fame by Russ Snowberger was put on display at the Indianapolis Motor Speedway Hall of Fame Museum. John doesn't limit himself to model car work. When he has the time, he has restored several of the Federal Engineer Specials wrenched by his father. This includes a prize-winning redo of the Federal dirt car driven to stellar performances by Larry Crockett, Bob Veith and others. John often drives this car at vintage racing meets across the country. "The apple doesn't fall too far from the tree."